Sold and fulfilled by Marche Ricche Fashion (4.2 out of 5 | 57 ratings). Ships from and sold by Marche Ricche Fashion. Stunning nails are set to be a regular thing with the new range of Lakme 9 to 5 long wear nail colors. Available in 20 vibrant shades, the finish is the latest trend in the world of Lakme for the independent woman of today. 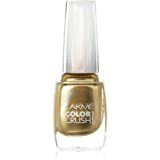 With perfect work wear shades this long lasting nail color locks moisture onto your nails while giving them a dazzling shine. Be a trendsetter, whether at work or at a party. 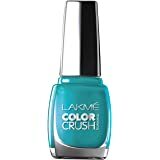 Lakme 9 to 5 long wear nail colors are sure to add a zest of vibrancy to your regular look. The chip resistant formula with intense color keeps you going through the week. Just apply a coat or two and let your nails do the rest. Shades are available at just rs. 220. For better finish, apply a second coat after the first has dried completely. Its chip resistant, long lasting. For better results you need to apply two quotes at least. 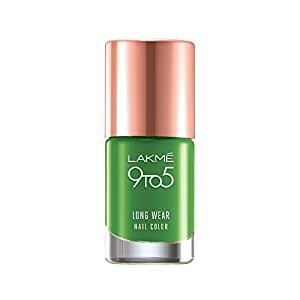 9 To 5long wear nail color goes well with Lakme 9 to 5 creaseless lipsticks, Lakme 9 to 5 weightless mousse foundation and Lakme eye conic kajal. This will surely complete your look. How to apply a coat of your favourite 9 to 5long wear nail color all over your nails avoiding the outer edges and the surrounding skin. Be sure to apply two coats of nail polish for that salon quality finish. I bought RED ALERT shade. Shade is cherry red suits wheatish/ fair skin type. 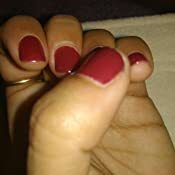 Finish of nail paint is smooth long lasting. One of the best in this price. Go for it!!! I Bought it for my mother on a frnd's recommendation. I am writing this review after applying it on mom's nails. Though the brand and the color combination shall boom, but I bought it from 'cloudtail' and found the product lacks viscosity i.e. it is less dense. perhaps the color is awesome and I shall recommend to buy such products from offline after visualizing physically. I have received a different shade ,which is baby pink and not the Rose Rush shade that I Ordered. I want to return it, but amazon does not allow to return nail polish as it is inflammable. 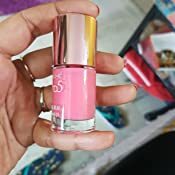 Also, I think this is a fake lakme product because the nail polish does not stick to the nails and does not spread completely. This is a waste product for me. Pretty color. Its better to buy the product from the market since the delivery charges for 75/- INR was charged. Color not received as shown in picture. Quality is also cheap. It's like a water not a paint. Very disappointed. 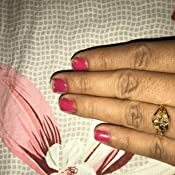 It is a fake nail paint. It got chipped off in one hour after application..please don’t buy. Better to buy such cosmetic directly from brand outlets.. The product received is not at all good. The nail polish is like a lump on the nails even after shaking it well before use. Moreover this item is not eligible for return. I'm not happy with the item received.